Ceramic grinders on peppermills are a huge advance, super tough they can tackle both pepper corns and coarse salt even if damp. Ours are so smart, they even grind your pepper for you. Push the button and the powerful electric motor creates a steady even grind. Finished in chrome and displaying your salt or pepper, these look great, and have the fun element of lighting up when in use. 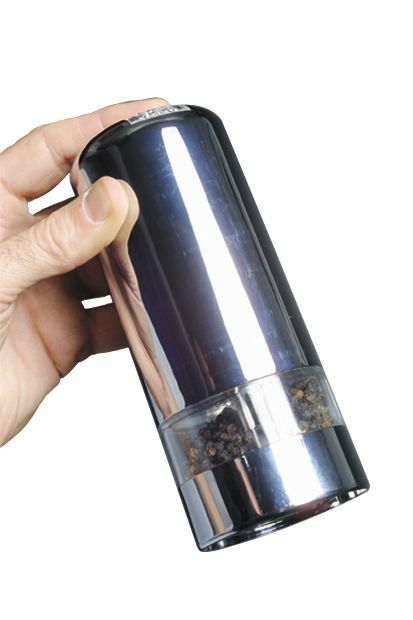 Ideal for families and for people with conditions like arthritis who find hand operating salt and pepper grinders painful or difficult. Peppermill runs on 6 x AA batteries (not supplied). Peppermill text, images and video are copyright.